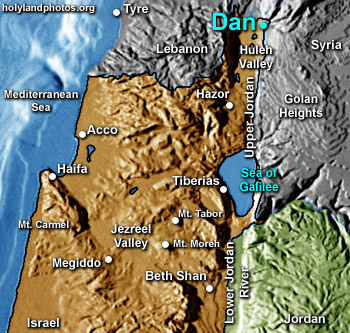 Dan is the name of a town mentioned 27 times in the Old Testament. It was located on the northern boundary of Israel and appears in the well–known phrase "from Dan to Beersheba." It is located near one of the powerful springs that feed the Jordan River. The Arabic name of this large 50 acre [20 ha.] site is Tell el-Qadi. Avraham Biran has been excavating here since 1966. Among his numerous finds are a very well–preserved gate from about 1750 B.C., a gate complex from the divided monarchy, and a cult site where Jeroboam's golden calves may have been placed.